If you could have any one — and only one — bike in the world, what would it be? 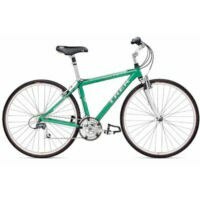 I’m kind of intrigued by the idea of having some kind of Jack Taylor touring bike, but with my limited bike experience right now I’m going to have to stay loyal and go with my current ride: a 1999 Trek 7500 SHX hybrid. It’s by far the highest quality bike I’ve ever owned (or ridden for the matter) and it serves me well on my daily commute and on all my longer rides to date. I’ve ridden a couple metric centuries on it and was comfortable the whole way both times. By far the best purchase I ever made during my pre-marriage-and-kids-ample-disposable-income era in terms of retaining value and overall return on investment (this goes beyond money). Do you already have that coveted dream bike? If so, is it everything you hoped it would be? If not, are you working toward getting it? If you’re not working toward getting it, why not? I’m working on building up a sport tourer/randonneuring road bike. I’m going the slow/frugal route and gradually acquiring components and saving up money. I’ve already got my wheels and now I’m searching for the right deal on a steel frame. At one point I was thinking either a new Surly LHT or Cross Check, but now I’m leaning more towards an 80s era UJB (Universal Japanese Bike) or Trek. If you had to choose one — and only one — bike route to do every day for the rest of your life, what would it be, and why? This is a tough one for me because I feel like I’ve got a lot more exploring to do around Spokane, but now that I think about it the answer is obvious. 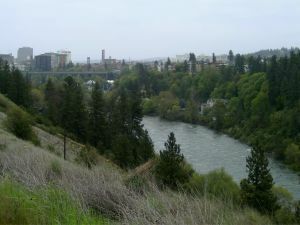 My longer commute route that runs along Ohio overlooking the Spokane River crosses the Sandifur Bridge and then heads back to High Drive after passing through High Bridge Park. That’s a nice scenic 10 mile ride either way that maximizes river viewing time. I think you can legitimately call Fatty devious and funny. And now that I think about it deviously funny may sum him up best, but he’s not a sick person. Owning 9 bikes is normal around here. Do you ride both road and mountain bikes? If both, which do you prefer and why? If only one or the other, why are you so narrow minded? My primary bike is a Trek hybrid that I mainly ride on road with the occasional trail thrown in for good measure. I do have an old beater Norco Cherokee single speed mtb that I built up, but it’s mainly a backup bike/winter snow bike. I like both, but right now I’m predominantly an on the road kind of guy because I do most of my riding during my daily commute. Have you ever ridden a recumbent? If so, why? If not, describe the circumstances under which you would ride a recumbent. I have never ridden a recumbent. If a friend of mine had one and said I should take it for a spin I would shrug my shoulders and give it a go. Have you ever raced a triathlon? If so, have you also ever tried strangling yourself with dental floss? I have never raced a triathlon or a marathon for the matter. I was a decent distance runner back in high school, but I’ve run minimally in the 17 years since then. My dad ran a few marathons way back when and beating his times has been in the back of my mind for a long time, but these days I’m way more interested in doing ultra-long bike rides like randonneuring brevets. Suppose you were forced to either give up ice cream or bicycles for the rest of your life. Which would you give up, and why? What is a question you think this questionnaire should have asked, but has not? Also, answer it. You’re riding your bike in the wilderness (if you’re a roadie, you’re on a road, but otherwise the surroundings are quite wilderness-like) and you see a bear. The bear sees you. What do you do? Hope the bear doesn’t find me all that interesting and get out of there as quickly as possible. Now, tag three biking bloggers. List them below.